Will there be a second season of Big Little Lies? Star Adam Scott recently spoke with the LA Times about the possibility of another season for the HBO TV series. Scott played Ed, the husband of Reese Witherspoon’s character Madeline, on the relationship drama. The cast also includes Nicole Kidman, Laura Dern, Shailene Woodley, Zoe Kravitz, Alexander Skarsgard, and James Tupper. There’s been speculation of a second season of Big Little Lies ever since season one finished earlier this year. While the HBO show was initially planned as a limited series, many of the drama’s stars (including Witherspoon and Kidman) have shown interest in another season. Will there be more Big Little Lies? What do you think? Did you enjoy season one of the HBO series? 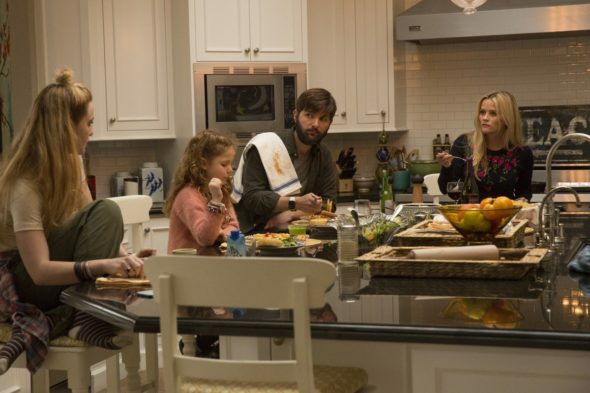 Big Little Lies: Season Two; When Will the HBO Series Return? LOVED IT!!! Please bring it back! No. It wasn’t good enough or enticing enough to warrant another season. Yes I would watch. I enjoyed the first season. Love the limited series and so very much want to see a second season!!!PLEASE!! I do think that there may be scope for a second season, despite the rather let down of a finale in the first. However, whilst they may reference the killing, they need to make sure that it is only in small parts. The real meat and bones of the story was the relationships between the families and the one upmanship elements that kept us glued to our seats, so there lies the dynamic that will bring people, especially parents back. Wildly popular among my friends and family of all ages!!!! We were stunned to read that it was a limited series. Would love, love, love a second season. I would love a second season – it was a great ending, but yes, there is more story to be told. Very intriguing, and wonderful acting. Great story-line; great characters.